When six-times Olympic coach Mick Miller discovered a lump on the side of his neck after a swim at his favourite beach in Sydney, little did he know that his life was about to take a dramatic twist. Following the diagnosis of throat and neck cancer, Mick was facing one of the biggest challenges of his life. During a 70-day stay in hospital, he lost a total of 24 kg, as he was unable to eat apart from a feeding tube and unable to speak. In hospital, Mick realised that he had been given a wake-up call. Having travelled extensively around the globe with various athletes and sporting teams, Mick decided it was time to see more of his own beautiful country. 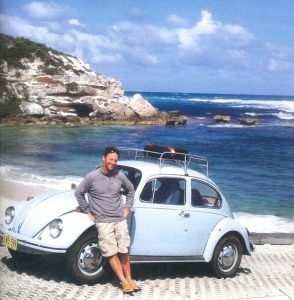 Wanting to keep his journey as simple as possible, he decided to travel around Australia in his 1968 sky blue Volkswagen Beetle named “The Rocket”. When he had gained some strength back, Mick’s journey of discovery and recovery began. He packed the Rocket with a 2-man tent, an esky, a sleeping bag, a blender and a few clothes; took a quick look at the map (turned it up the right way), found highway one and then he was off. Mick spent 15 months on the road and recorded his journey along the way. Every couple of weeks he would send a video clip and a bunch of photos to his friend Robbyn Ford, who transcribed these into Mick’s blog. 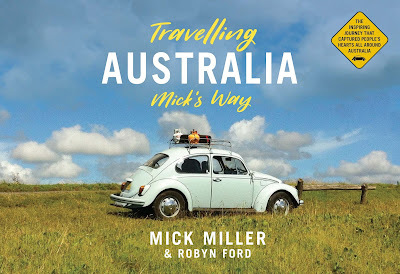 From Bulahdelah to Bruny Island, Travelling Around Australia Mick’s Way follows his journey and captures Mick’s daily adventures in the backdrop of the awe-inspiring Australian landscape. His story and his photography are real, heartfelt and inspiring.